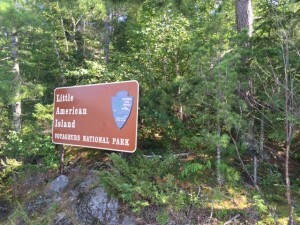 Our next stop after Isle Royale was Voyageurs National Park, right on the Minnesota/Canada border. There isn’t a great direct route from Grand Portage, so it was close to a five-hour journey. With the ferry from Isle Royale putting us back on the mainland around 4:00pm, we were destined for a late arrival. However, after a couple of days eating nothing but snack food, a good dinner was needed. We stopped in Ely, Minnesota at a place called the Chocolate Moose, where I enjoyed a tasty bison burger, and my husband and I splurged on a dessert of warm raspberry-peach pie, a la mode, of course. Good fuel to get us through the last leg of what had been a long day. We rolled into our hotel, Thunderbird Lodge in International Falls, Minnesota, a little after 10pm. The office was closed, so the bartender in the lounge checked us in. The Thunderbird is an interesting spot that clearly caters to fishermen – our room had a sign about fish gut cleaning procedures and courtesies. The room itself was small and a bit dated, but fine. After a long day, we both slept like babies. Morning in International Falls was overcast and drizzly, but thankfully by the time we finished breakfast things were looking up. We headed over to Rainy Lake Visitor Center to get our bearings. Voyageurs is a water-based park, and to truly appreciate it you must either have a boat of your own or book a boat tour. 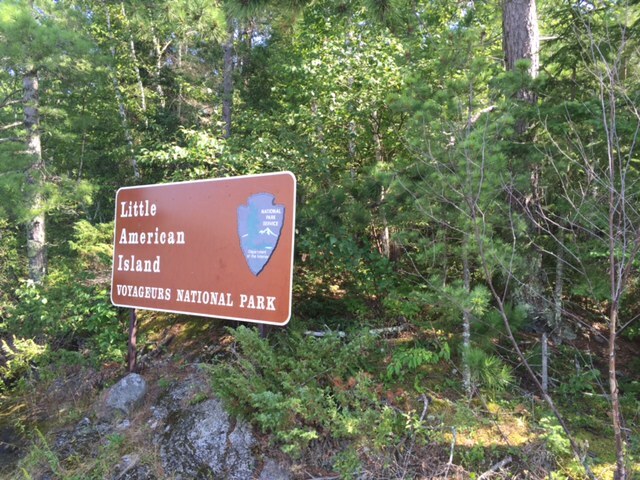 There are also a few hikes; while waiting for our afternoon boat tour to start, we walked the Oberholtzer Trail, a 1.7 mile trek close to the Rainy Lake Visitor Center. It was a fine walk, but truthfully, it was nothing special and a bit buggy. Hiking is not what the park is about. If you’re not interested in boats or getting out on the water, don’t bother heading to Voyageurs. We booked the Grand Tour boat tour of Rainy Lake, a 2.5 hour boat ride around the lake that included narration and a stop on Little American Island, which was once home to mining operations during the Minnesota gold rush. It was nice to spend what had turned into a lovely afternoon out on the water. While out there we spotted a few bald eagles – the park has quite a few of them, from what I understand. If you’re interested in the Grand Tour, make reservations before arriving. We overheard several tourists trying to get a spot day-of, but it was sold out. The boat tour concluded around 4:30pm, and from there we were on our way back south. We had only booked one afternoon in the park, and for us it was enough. That said, if you’re a fisherman or are interested in a houseboat, it would be easy to spend much more time there. We booked a hotel in Bemidji, Minnesota that night, a town a couple of hours south on route 70, a long, fairly boring stretch of highway that we were happy to get through. 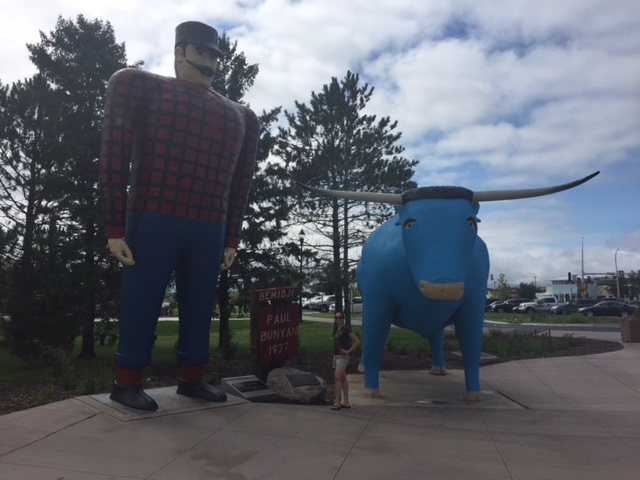 Bemidji isn’t a big town, but it has a nice lake, a few cute downtown shops and a giant statue of Paul Bunyan and Babe the Big Blue Ox that attracts tourists seeking photo opps, myself included. Bemidji was our last stop in Minnesota. From there it was on to Fargo, North Dakota and the national parks of the west.